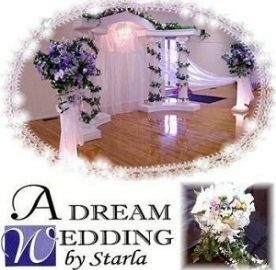 Get A FREE Brochure from "A Dream Wedding by Starla"
Planning that special day in your life can be fun and exciting. You want everything to be perfect. You don’t want to worry about all the nitty gritty details on your wedding day. You want it to run smoothly and without a hitch. You want to absorb the special feelings that come by sharing this moment with your fiancT, friends, and family. You want to enjoy the beautiful setting provided by the elegant wedding backdrops and decorations that you have always dreamed of. Hiring a professional wedding decorator makes a lot of sense while saving you a lot of cents. Register online for our ‘free wedding planner’ along with information on discounts, promotions, and coupons. Please mention Salt Lake Bride when you contact Starla! Starla did my granddaughter's wedding and it was BEAUTIFUL !! !